We will not be running the Fruit and Veg program for the 2018/2019 school year. If you are a parent who can donate an hour or two a month we would love your help to bring it back. Contact frankhobbs.pac@vcpac.ca for more info. The BC School Fruit & Vegetable Nutritional Program is a provincial government program that delivers healthy fruit and vegetable snacks to children at schools across the province. It’s a really successful program and is running it’s eighth year at Frank Hobbs. By providing a healthy, fresh snack and presenting children with a wide range of fresh foods, we aim to show children how they can make their own healthy choices. What happens at the school? A few days before the produce arrives at the school the main co-ordinator provides information about the produce to our Principal. This is then presented to student readers, who pass on the information to all students via the morning school announcements. After the food arrives at the school it is counted, sorted and distributed to the classrooms by parent volunteers. Teachers and/or students then give out the snacks to the students. The volunteers aim to get the produce out to the classrooms as soon as it is delivered. Usually the delivery is around 10am, so in practise the delivery is soon after that. The intent is for the fruit and vegetables to be enjoyed during class time, rather than used as a substitute snack at recess or lunchtime. 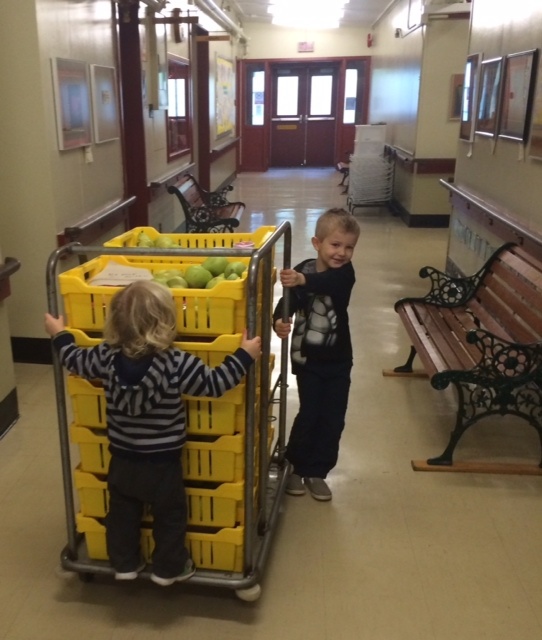 Some of our youngest volunteers helping out with distribution…it takes many hands! Jen Farquhar is helping to co-ordinate the program at Frank Hobbs this school year. She is looking for help with the fruit and veg program and is keeping her fingers crossed for some new volunteers to help her make this a great year for the kids! Please contact Jen at Jfarquhar1@telus.net if you think you may be able to help out with this program this school year. Remember – we can’t offer this opportunity without essential volunteer time….it’s another great way to know your input really appreciated.